In stock now from Bloomsbury Press. Order now to have your copy signed by Christopher Phillips. 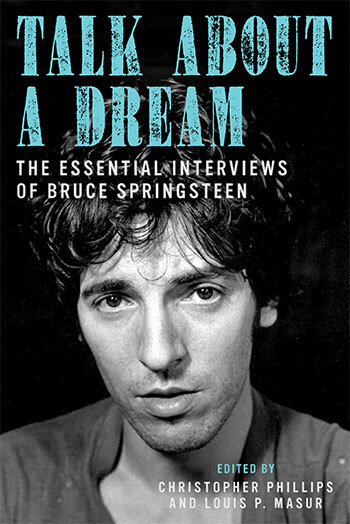 Edited by Phillips and Louis P. Masur, Talk About a Dream is a hefty collection, gathering 40 years worth of conversations with Bruce Springsteen, with interviewers including Robert Hilburn, Ed Sciaky, Dave Marsh, Chet Flippo, Neil Strauss, Bob Costas, Mark Hagen, Elvis Costello, Nick Hornby, Robert Santelli, and many more. Considering his prominence on the rock 'n' roll landscape, Springsteen has spent remarkably little of his 40-year recording career speaking to the press. But when he does decide to sit down and talk, the conversations tend to be momentous. Q&As with Bruce reveal an artist with great insight and self-awareness, a student of music, an avid searcher, an astute observer of humanity from the boardwalk to America at large. Much has been written about the Boss, but few can be said to know the man as well as he knows himself, and the best of Springsteen's own words are collected here in Talk About a Dream, carefully selected and introduced by Phillips and Masur for context. Gathering more than 30 different interviews spanning from 1973 to 2013, this volume focuses squarely on eye-opening conversations that chart Springsteen's development as an artist, a writer, a musician, a thinker, and a public figure. Includes an eight-page photo folio, with B&W photographs spanning four decades by Barbara Pyle, Lynn Goldsmith, Eric Meola, Jim Marchese, Pam Springsteen, Danny Clinch, and Frank Stefanko. Christopher Phillips has been covering the career of Bruce Springsteen for 20 years as the editor and publisher of Backstreets. He also created and maintains Backstreets.com, the primary web destination for Springsteen fans. Louis P. Masur is a cultural historian and the author of many books, including Runaway Dream: Born to Run and Bruce Springsteen's American Vision. He is a professor of American Studies and History at Rutgers University, and lives in New Jersey. "There have been other collections of Springsteen interviews, but this excellent volume is the most up-to-date with 40 interviews beginning with the February 9, 1973, issue of the now-defunct Asbury Park Evening Press and running to his conversation with Robert Santelli at the GRAMMY Museum in February 2013. Print interviews are matched by transcripts from press conferences and radio and television interviews, including interviews with Scott Pelley and Elvis Costello. Each interview is preceded by a brief introduction that places it in a historical context... What is most significant about the anthology is the changes in Springsteen himself, as he matures from a shy and inarticulate leader of a Jersey Shore bar band to the loquacious and intelligent observer of the human condition that he is today. It is a remarkable transformation and Phillips, the editor and publisher of the Springsteen magazine Backstreets, and Masur, author of Runaway Dream: Born to Run and Bruce Springsteen's American Vision (2010), have lovingly put it all together in one amazing volume. A worthy edition to the Springsteen literary canon."